Here's my 23rd ATC for The Craft Barn Alpha Dictionary Challenge where the letter this fortnight is Q. Quite a tricky one as there are not that many words - Quaver and Queen stood out along with Quayside but I really couldn't see how I could fit all three together!! There are no Q colours so I started off with brown to contrast with my P and R ATCs either side. The background is a mix of Rusty Hinge and Vintage Photo Distress Inks overstamped with a Music stamp from Oak House Studio inked in Cocoa Bean Brilliance. 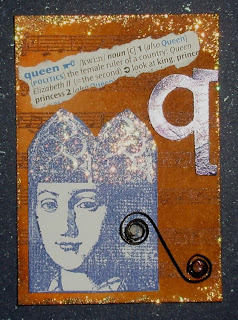 The Queen is from Paperartsy's Lynne Perella set LPC008 inked with Majestic Blue Versafine. I've added some Waterfall Stickles to make her crown shine and edged the ATC with it too to brighten it up a bit. It's just finished with a Quilled Scroll made with brown card, the torn dictionary definition and the alcohol inked vinyl Thicker. I'm sure there'll be loads of Queens this time as the choice is so limited. Thanks for looking and for your wonderful comments last time. I'm off to see what others have been up to!! Wonderful Queen ATC Elaine, looking forward to seeing all your ATCs together at the end of the challenge. Great ATC, love all the "Q" words you have used. Love the colouor combination. Hasn't this challenge been fun? Beautiful ATC and a beautiful queen stamp! Great ATC Elaine, well done.